New Japanese partnerships show a desire to diversify and limit risk in Southeast Asia. On Monday, Japan’s Marubeni Corp announced it would be acquiring a 20 percent stake in a power generation and transmission business based in Cambodia. The business, which is currently owned and operated by Malaysia’s Leader Group, will be the first time a Japanese company has invested in the energy market in Cambodia, according to Kyodo News. The investment is part of Marubeni’s three year, medium-term management plan, which was laid out in April 2013 to strengthen and expand its overseas business. The plan identifies five countries in the Mekong Delta as an investment priority. With 1.1 trillion yen dedicated to the management plan, the Mekong Delta is one of a few investment targets set to receive significant funds for energy infrastructure, offshore projects, and the natural gas value chain. Leader Group is not only prominent in Malaysia, but claims that it is the biggest cable and wire producer in Southeast Asia. It made its foray into the Cambodian energy market in 1994 in an agreement to build and operate a 35MW diesel engine power plant in the capital of Phnom Penh, and in 2009 received another contract to build a 100MW coal-fired plant in Sihanoukville. It has plans to further invest in Cambodia’s downstream energy market, as well as sign contracts for new power plants in the region. Cambodia is seeking to increase access for foreign investors in order to build the necessary infrastructure to further its economic development projects. The country has recently given foreign investors the same rights and protections as domestic companies. According to the Bangkok Post, if foreign companies meet the criteria for a “Qualified Investment Project,” they are eligible for a 20 percent tax rate, three-year tax exempt status, and are exempt from custom duties and are guaranteed free profit repatriation. Japanese companies have been targeting Southeast Asia for investment for quite some time, attracted by the region’s cheap labor, high growth, and ease of investment. While Thailand has long been the preferred destination for investment, Japanese companies have begun to look for new partners and new markets in the region in order to diversify their risk and identify new potential engines for growth. 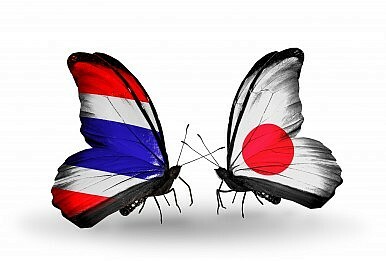 With political instability again descending on Bangkok, and despite Japanese companies reaffirming their investment relationships with Thailand, observers are expecting movement toward new projects and partnerships with other countries. Whether or not this becomes a trend depends on how quickly Thailand is able to stabilize its economic and security environment. Cambodia is a long way from becoming the investment hub that Thailand is, but other countries can expect to benefit from Bangkok’s continued political turmoil. Shinzo Abe’s recent visit to France highlighted areas of cooperation in a growing relationship. US-Japan Trade Agreement Negotiations: Why Now?Is Japan Anti-China?Japan’s New Imperial Era: What’s in a Name?South Korea and Japan: Where to From Here?Does Japan's New Climate Change Strategy Go Far Enough?